We came to this country seeking the American Dream. Our parents saw this Golden Mountain as a symbol of the future and what it could provide. So they vowed to leave everything behind, their native tongues, their childhood memories, the friends that knew their every secrets, their favorite weekend cafes, early morning dance halls and sleepy beach hideaways for a promise of a better life. It was the early ’80s with traumatic memories of the Vietnam War still brandished onto their minds. They were young and feckless, proud citizens of their beautiful countries that radiated in culture, life, light. But they rolled up their sleeves and said goodbye to their homelands, stuffing their pockets with their life savings of $100, ready to work and create a better life for themselves and their offsprings. Instead of fighting back, our parents found the quickest way to success was to assimilate, appeasing to the White man’s ways. So came the Chinese restaurants that catered to the White palette. General Tso’s chicken was a mix between Southern fried chicken and a bastardized Oriental flavor that mixed salty soy sauces with a dash of MSG. There were the liquor stores and laundromats that were built for the American GIs. These were modern day geisha houses of sorts that pleased the White man and his needs. Soon enough we became the “model minority,” a myth that the White man presented to us like a gift from the White heavens. Because we pleased him and served him well, he would grant us immunity. We wouldn’t have the hardships of the blacks or Hispanics or the Muslims or gays, he led us to believe. He would have our backs and all we’d have to do in return was continue doing a good job. Little did we know this is how they’d use our people to pit cultures against each other. 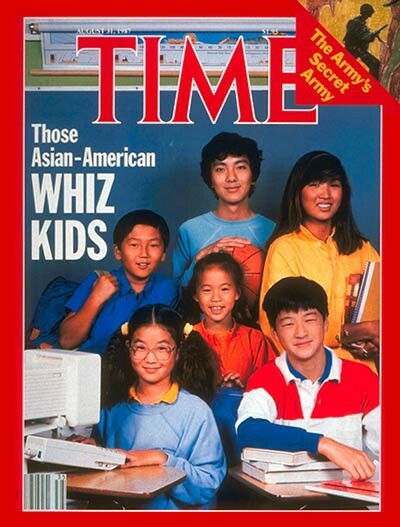 “Those Asian-American Whiz Kids,” they’d say. See, if they can do it, what is your excuse? The White man whispered in our ears and sold us the promise of success if only we continued to lay low, work hard, and say little to nothing. “Don’t be like those other colored folk. You need to fear them, you need to separate from them. They’re not your friends,” they warned us. Then came the Los Angeles Riots of 1992, evidence that this polarization of cultures led to a catastrophic end. Still, throughout the years, we worked harder and harder for the White man. We bled, we cried, we sacrificed to uphold our end of the bargain. Confucianism and filial piety, in fact, was in our very DNA and to serve was the Asian way. For decades, we blindly continued to believe that the White man cared for us. That he had our best interests in mind. He welcomed us into this country with open arms, he reminded us, and we needed to continue paying him back for his kindness. In due time, these lies caught up to us and we’ve realized that the White man’s promises were all lies. All along, the transaction was pretty straightforward: Citizenship had been traded for dignity, an American passport came with annihilating our heritage. All along, the transaction was pretty straightforward: Citizenship was traded for dignity, an American passport came with annihilating our heritage. All this time, the White man was diluting our cultures, stripping us of our mother tongues, deleting our histories, extracting our pasts, all so that we could become his slave. So that we wouldn’t have an identity. We were simply alive by heartbeat alone but altogether invisible. But by the time we realized this, it was too late. In 2016, it’s clear that I am invisible. Like my people, I have no voice. I have no grounds to stand on. No foundation in politics, no cultural icon like Jay Z, no place in American history. We are a people that have worked so hard to belong and now we have a sudden painful epiphany that we never belonged in the first place. When Donald Trump told a college student to go back to his country when he was a Korean born in the United States, there was hardly outrage. When we think about hate crimes that happen on the daily to our Chinese deliverymen throughout the country, or the atrocities that happened to Vincent Chin, there is no national conversation. When our roles are white-washed in Hollywood, with someone like Emma Stone playing a half-Asian, there’s only a blink of an eye but no change. When a publication like Glamour Brasil slants their eyes and bows in a blatantly racist manner, there’s hardly an apology. Instead, their editor in chief stands firm that she wasn’t racist at all. How can you be racist towards Asians? How is it that we take away Asian rights? How can Asians even be considered human? They don’t even exist. Now more than ever, as Asian Americans, we must wake up. We must hoot and holler, bang on our drums, jump on cars, flail our arms around, pounce at any opportunity to scream, just so that others can pay attention to us. We must walk with our black brothers and sisters, ensuring that Black Lives Matter. We must stand up for our Muslim neighbors who are attacked. We must sit with our Hispanic friends, those whose lives are about to change. We must hug our LGBTQ community and let them know that they are loved. Because continuing to remain idle leads to genocide. It’s not too late, my friends. We need to show that we can be angry. We can be ratchet. We can be intimidating. We can be human. Because only when we do, can we resurrect from the grave, pump blood back into our systems, have our skins grow back and become visible once again.